Cyclophosphamide and ifosfamide are chemotherapeutics used to treat various cancers and autoimmune diseases. A major limiting factor of their use is the resulting uro-toxicity which can lead to ongoing bladder pain, urgency, feelings of incomplete bladder emptying and dysuria. Both drugs have been shown to cause increased micturition frequency and bladder hyperactivity in experimental models suggesting changes in sensory activity may be involved in the bladder dysfunction after treatment. The aim of this study was to determine the effect of cyclophosphamide and ifosfamide on the activity of high and low threshold bladder sensory nerves. Male mice (12wks) were administered either cyclophosphamide (100mg/kg) or ifosfamide (200mg/kg) by intra-peritoneal injection and sacrificed for experimentation after 24 hours. Intravesical pressure and bladder afferent nerve activity were measured during bladder filling and emptying in vitro. As volume in the bladder increased both intravesical pressure and bladder sensory nerve activity increased. Nerve activity after treatment with cyclophosphamide or ifosfamide was enhanced throughout bladder filling. At maximum distension the total nerve activity was increased significantly from 182±13 nerve impulses per second (imp/sec) in control animals, to 230±14imp/sec in cyclophosphamide treated mice (p<0.05) and 226±17imp/sec in ifosfamide treated mice (p<0.05) (n≥6). Single nerve fibres were identified from each recording and characterised as either low threshold (activation at pressure<15mmHg) or high threshold fibres (activation at pressure>15mmHg) and the activity of each individual fibre determined. The activity of high threshold nerves was unchanged after treatment with cyclophosphamide or ifosfamide. Whereas cyclophosphamide and ifosfamide treatment enhanced activity of the low threshold nerves (p<0.05)(Fig 1). 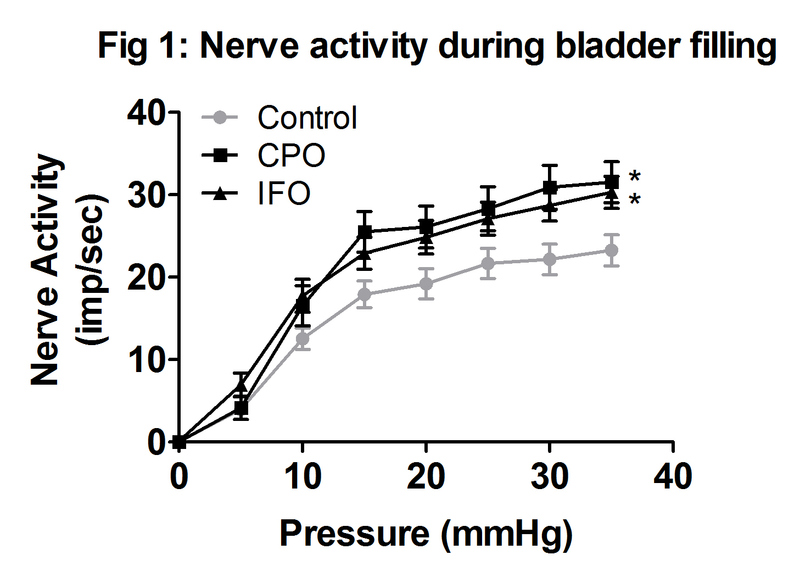 Both cyclophosphamide and ifosfamide enhanced low threshold bladder sensory nerve activity. Increased afferent sensitivity and firing may explain the pain, urgency and feelings of incomplete bladder emptying experienced by patients after treatment with cyclophosphamide and ifosfamide and provides a target for treating these adverse effects.